A while back I bought a large number of spiral cages and spring coils in a clearance sale at a ridiculously low price. "They'll come in useful one day" I thought . . . so there they sat for quite some time in my bead stock. I was never quite sure what to do with them, and then in a moment of boredom I was playing around and came up with this idea . . . Using memory wire I simply threaded them on with some olive beads (AB) and faceted beads (AB) . 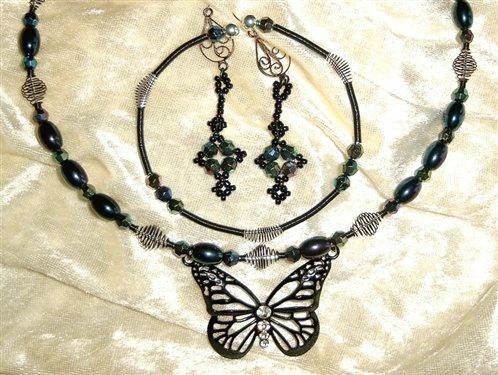 With the addition of a butterfly charm I had a choker and bracelet set. I now have only one regret . . . why didn't I buy more of those coils and cages?